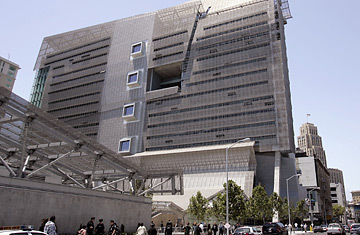 The 18-story San Francisco Federal Building has an austerenot to say severefaçade, but it's deceptive. It's really a machine for delivering sunlight and fresh air to the people who work there. Eighty-five percent of the work space gets natural sun, and windows manned by computer let in outside air to maintain the building's temperature with a minimum of air-conditioning. The structure uses a fraction of the energy a conventional office building would. Next Can You Feel Me?